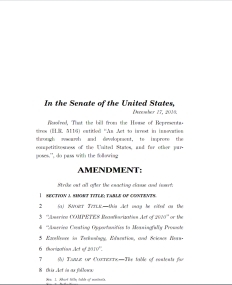 Exciting news from the halls of the U.S. Capitol Building in Washington, DC: Congress has passed the America COMPETES Act. While we'll leave the full analysis to the more politically inclined blogs, we're thrilled to point out one key aspect of this legislation: once this is signed into law and takes effect, every federal agency will have the ability to conduct incentive prizes! Point Solution Prizes - "rewards and spurs the development of solutions for a particular, well-defined problem"
Exposition Prizes - "helps identify and promote a broad range of ideas and practices that may not otherwise attract attention, facilitating further development of the idea or practice by third parties"
Participation Prizes - "create value during and after the competition by encouraging contestants to change their behavior or develop new skills that may have beneficial effects during and after the competition"
There's also a generic "other" category. Incentive prizes aren't a panacea, but they are a great tool to have in one’s toolkit. They don’t solve every problem automatically, but there are many times when they are the best way to achieve radical breakthroughs. The more people and the more agencies that can strategically employ them as a tool, the better! And believe it or not, before this legislation, only NASA and part of the Department of Defense had clear legal authority to use prizes as a component of their procurement and R&D strategies. Full text of the bill is available here (PDF). The section on prizes begins on page 17.